The Cheltenham Gold Cup is not only the most prestigious event in horse racing, but one of the most anticipated events on the sporting calendar. The crème de la crème of horse racing sees the best jumps from our beloved sport battle it out for total supremacy. Previous winners include Coneygree, Don Cossack, Sizing John and most recently, Native River. To win a Cheltenham Gold Cup, a horse needs to be at their extreme best. That is backed up by not only the stature of the most recent winners, but their lack of performance since. To win a Gold Cup is no mean feat. When winning the RSA Insurance Novices' Chase at the festival last year, Presenting Percy looked a world beater in the making. He had behind Monalee 7 lengths and Elegant Escape a further 7 lengths and was immediately installed as Gold Cup favourite. The hype has dwindled somewhat, and we’ve only seen Percy out once since. His trip over hurdles at Gowran Park suggested the Gold Cup may not be the target but connections have since confirmed he will go. His lack of fence jumping since this time last year, however, makes him hard to back. Clan Des Obeaux surprised everybody when landing the King George at Christmas. He has since confirmed it was no freak win by taking the Betfair Denman Chase at Ascot with ease. His front running style with regular jockey, Harry Cobden, makes him a force to be reckoned with and may well go off favourite. Last year’s winner may put it up to Clan Des Obeaux in the earlier stages and will no doubt run a good race. Jockey, Richard Johnson, has the most wins at Cheltenham this season, is clear in the jockey’s championship and knows this horse better than anybody. The pressure is on to repeat the feat of last year but if anybody can do it, it’s this boy. Worth taking an early each-way price, for sure. Kemboy represent Willie Mullins’ best chance of Gold Cup success. Paul Townend or David Mullins have done the steering recently so take note if Ruby Walsh picks Kemboy ahead of Bellshill or Al Boum Photo. He’s beaten good company, but this is the hardest challenge of his career thus far. 4th to Kemboy in a grade 1 over Christmas and historically has performed better over the shorter trip. May find 3m too hot with likely front runners Clan Des Obeaux and Native River going guns blazing. Last year’s runner up was involved in a terrific battle with Native River the entire race, then went out and won the Aintree Bowl a month later. A horse that has rightly gone off favourite on his last 9 appearances find himself a long way down the board this year after disappointing in grade 1s at Haydock and Kempton. Nicky Henderson will no doubt have him primed so represents good each way money and can never be written off with less than a good chance. Al Boum Photo arrives with colourful form including running out at Punchestown Festival last year and falling at Cheltenham Festival. Mishaps aside, Al Boum Photo has shown real quality beating Total Recall and Shattered Love. Steps up in company and trip so relatively unknown territory. Held on form behind Kemboy and Bellshill in Ireland and Native River in England. Noel Meade's best chance at the Gold Cup this year but has a lot to find. It was hard to keep backing Thistlecrack until his second behind Clan Des Obeaux in the King George. By no means back to his dazzling best but ran an extremely good race in second. Can pick off most of the midfield with his quality. 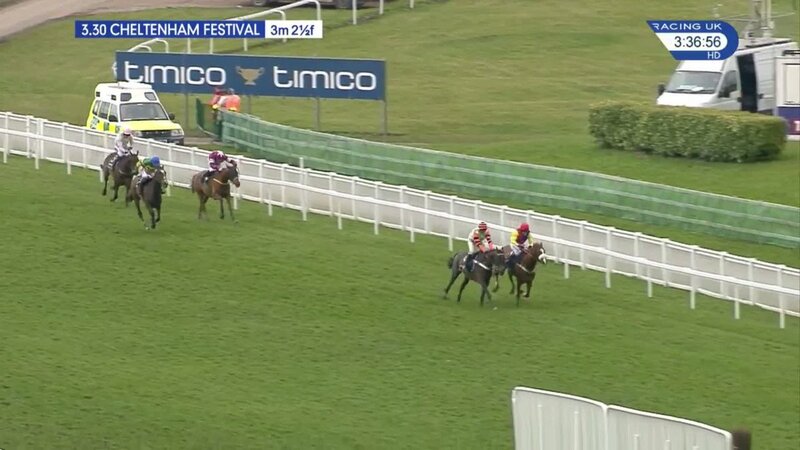 Jockey, Tom Scudamore, could seemingly do with letting the horse run his own race. Another solid each way bet. Frodon has enjoyed success this year under Bryony Frost. But, it would be one hell of a story for this combination to even place in the Gold Cup and Paul Nicholls reasoning for running him is a little suspicious. Has performed well in grade 2s and 3s but could find this too competitive. More successful over further but enough proof that he stays the trip. Interesting prospect that may come into play if the ground turns soft. Most recent run over this trip was beaten by Frodon. Beaten by Monalee but staying on at Gowran Park in February. Performs best over this 3m trip. Has a lot to find on recent form. Has only won on yielding ground since 2015. Was travelling fine when bought down in the King George at Christmas. Haydock specialist that revels in wet conditions. One to back on a going day but hard to back ante-post. Despite that, never without a chance in any grade one. Jockey, Daryl Jacob, knows exactly what to do with this horse, should he be in contention. Seems overpriced in the market. Intriguing entry that arrives in great form. Has won over shorter and further distances so can stay the trip. This will be his steepest test to date and looks outclassed. Star novice but has a lot to find. Last seen when dispatched by Captain Redbeard in a match race over this distance. That should have been a procession as he went off 1/6f. Match company is a completely different prospect, but he looks impossible to back after that performance. The large market price suggests Double Shuffle won’t run rather than the calibre of the horse. He hasn’t been disgraced recently but hasn’t look the horse he was in 2017 when consistently placing in grade 1s and 2s. Unsure whether Killultagh Vic will turn up here or the Ryanair Chase but looks outclassed here. You may well see other names in the market for the Cheltenham Gold Cup, but they all hold entries in other entries and are likely to go there. Nothing is certain, however, so keep an eye on the markets and enjoy the best race in the world.